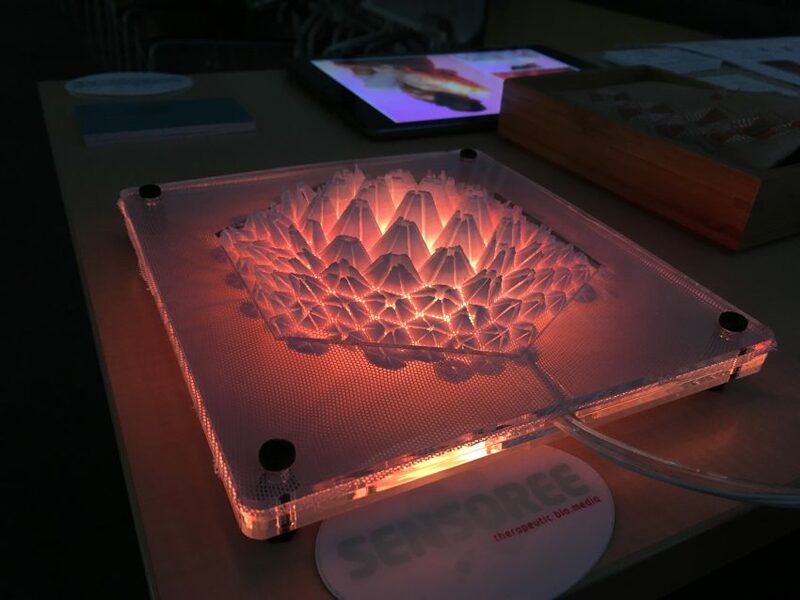 How to Share Amazing Goosebumps with Tech #WearableWednesday #wearabletech #3Dprinting #tech @sensoree « Adafruit Industries – Makers, hackers, artists, designers and engineers! A buzz erupted on Sensoree‘s social media recently when biomedia designer Kristin Neidlinger mentioned the team was prepping for TEI 2017 (Tangible, Embedded and Embodied Interaction) in Japan. The conference is happening now, but I was able to have a quick exchange of emails with Kristin to get the scoop on her team’s latest design. Apparently they have borrowed from past work like AWE Goosebumps to create two outfits that can share the raised hair feeling— AWElectric. It may seem strange to want to share goosebumps, but this is all based on research showing that the good goosebumps we experience dealing with awe have a positive influence on our well being. These suits are intricate genius with biosensors tracking breath, galvanic skin response and heart rate variability. LEDs pulse orange in the 3D printed areas following the breath, until a purple glimmer occurs signifying frisson (excitement). It’s all part of what Kristin refers to as “extimacy”. When awe is detected, 3d print Goosebump Fractal, pneumatic fabric inflates and flickers to animate the feeling. Then, AudioTactile, conductive embroidered “speaker” fabric plays the frequency to evoke goosebumps in the partner design as it tickles the skin to make hair stand on end. So, this outfit can sense a specific emotion, use its fabric to mimic goosebumps and then send the signal to create goosebumps in the partner’s outfit. 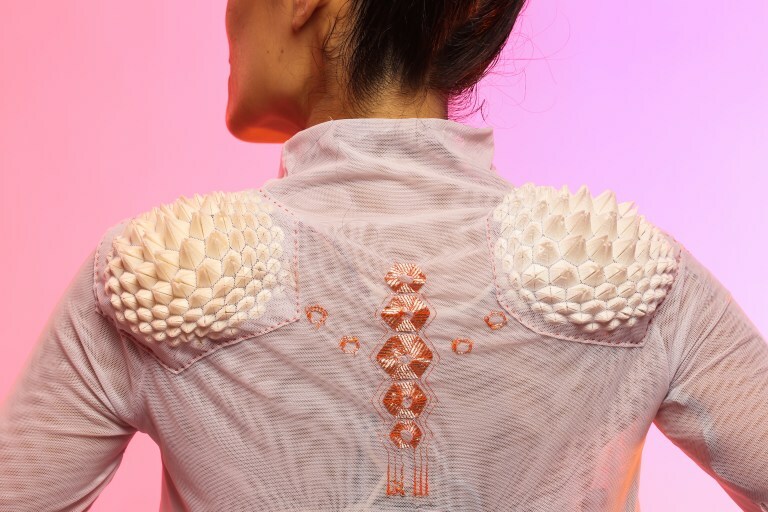 The 3d print fabric, invented by Sensoree, is related to the hexagon formation of skin cells, and inspired by Buckminster Fuller’s famous geodesic domes. It’s fascinating to watch how the peaks open showing their triangles when inflated. My initial research was to create tools for Sensory Processing Disorder (SPD) – a condition that ranges from ADHD to Autism. These designs are more fantastical concepts to inspire the ideas. It’s fascinating work in an artistic package and I hope that it leads to another form that will help those with the disorder. For now there is much to be gained just from the great 3D printing techniques here. Once again Sensoree has done the research to understand the physicality of the emotion and invented the perfect fabric to express it. If you would like to experiment with 3D printing textures for wearables, check out our learning guide for the LED Stego Flex Spike Hoodie. It’s a great intro to wearables and 3D printing that will get you psyched about future fashions.